Yes, AWS gives guidance on how to package Python for Lambda deployment. This is good and well, but who wants to drop all of their dependencies in the same directory as your code. I don’t! I prefer a “lib” or “vend” or some other subdirectory. However, this story isn’t about that. It’s about the journey of getting to the point where I can even complain about having my dependencies in a sub folder. I like using the Serverless Framework to manage the development of my Lambda functions. I’ve been using it since pre-1.0 (yes, including needing to rewrite when they made some major direction changes during their 1.0 alpha!). It does a decent job and helps to keep me honest and fits into my overall workflow. That being said, it (and AWS) wants Python 3.6. So much so that Serverless aborts when attempting to use Python 3.5. Googling around pointed at several options. Many pointed directly at upgrading the system Python to 3.6. Having completely trashed operating systems before by doing such foolhardy things, I hardly felt that this was the correct choice. However, I did run across an AskUbuntu suggestion for using pyenv to manage multiple Python installations. This seemed more my speed. If you have used something like Node Version Manager (NVM), you will be somewhat familiar with the premise of pyenv. Succinctly, pyenv is a tool that can be used to manage various Python installations. It also includes some plugins that handle extended features like handling Python “virtual environments” across the multiple installed versions. Setting up pyenv is pretty straightforward. It installs and runs locally under your account. However, there are some dependencies you’ll need to install in order to compile other verisons of Python. Logout and log back in for the changes to take effect and you are good to go. Letting pyenv build Python is also fairly simple. That installed version 3.6.4, which was current at the time of writing. The following two commands make use of a pyenv plugin called pyenv-virtualenv to configure a virtualenv for the newly installed Python. It also sets it to be the default virtualenv whenever you spawn new shells. This created the “general” virtualenv. Feel free to call it whatever you like. This sets the default virtualenv to general. What insanity is this? I just installed seemingly installed 3.6.4, and the error is seemingly pointing in that general direction. So what gives? Long story short, the virtual environment is missing the python3.6 binary. You’ll see that binaries like pip3.6 appear, but not python3.6. Serverless counts on the python3.6 binary as it wants to enforce version compatibility between local invocations and when the functions live in AWS. I spent some time working with the thread in #206 as it seemed to be closest related. I dug into their code as well as the code for venv, the Python 3 way of generating virtual environments. The Python folks were quite zippy in their response. Apparently this is expected behavior. Basically, if you call -m venv using the python3 command, you don’t get a python3.Y binary. However, if you call -m venv with the python3.6 binary, you DO get all the binary. Seems “off” to me, but they confirmed that this is the intended behavior. On the plus side, the Python developer who responded did indicate that the documentation is unclear (read: completely fails to mention) the nuances with how the venv module is called. So the ticket has been renamed and will now work to resolve the documentation issue. So I submitted this PR that works around the issue by having pyenv-virutualenv call -m venv with the “fully qualified” binary (in this case python3.6). Thus far, the PR sits, yet to be applied. Honestly, I’m not sure it’s the best solution, given that Python’s expected behavior is to behave differently based on how it is called. Is it really pyenv-virtualenv’s right to force the end user’s hand on this? For my use case yes, but what about other use cases I’m not considering? However, I’m not going to let this get to me. I’m going to press on. I’m going to continue to push for a proper resolution to the pyenv-virtualenv situation and contribute where I can to push the community in the right direction. In the meantime, if you have the need for your pyenv-virtualenv to generate the proper binaries, clone my fork of pytenv-virtualenv into your ~/.pyenv/plugins sub directory. I hope that you have a prosperous 2018!! Thanks for reading! I’ve taken a liking to Todoist for tracking my daily tasks, professional goals, and helping my managers organize our major intiatives. However, their reporting is lacking. You can use the print feature, but that’s not terribly flexible. Furthermore, I’d like to be able to have some sort of mechanism to track changes over time. Fortunately, Todoist provides a couple different APIs to develop against. They also provide support for a Python library that wraps their REST and Sync APIs. What I want to do is build a service that provides some additional value for Todoist users, and I want to implement that using serverless technologies atop AWS Lambda. When you get into the serverless environment, you are restricted on things like storing data persistently within the serverless platform. Neither of these are scalable solutions, particularly if scalablity and not being throttled are requirements. That’s a bit involved for the way the API class is currently written. I’m also not quite comfortable to take an axe to their API and fight that battle (yet). Without completely rewriting the Todoist Python library, how did I work around this? One thing I did learn about is monkey patching to dynamically modify classes. With that said, I was able to fairly trivally replace two methods within the TodoistAPI class in order to use Redis as a backing store for the cached Todoist data. To keep it simple, all of this code landed in the prototype script I’ve been using to explore the API and the library. One could abstract this out appropriately (and perhaps that’s yet a better position than attempting to re-architect the Todoist Python library). Below are two methods I created. The intent was to mimic, as closely as possible, the original API code as to not disturb the original functionality within the library. This was done by replacing two specific internal calls, _read_cache() and _write_cache(). You will note that I am not doing anything fancy with Redis. I had started with delusions of grandeur and started down the path of using HSET and HGET to store hashes directly. I quickly learned that this is not straightforward, especially when dealing with types other than strings. It is possible to do all sorts of contortions to get there, either manually mapping and decoding the data returned from Redis, or using Redis 4 and the ReJSON module. One should note that (at the time of writing) AWS ElastiCache is still on Redis 3, and therefore does not support modules. With my tail between my legs, I fell back to simply serializing the JSON completely as a string and also the sync token – mimicking exactly the way the original methods work on the file system, except instead writing that data to Redis. It works for now, but I’m waiting for the other shoe to drop as I dig further into the weeds. Below is where the magic happens. Using the ability to monkey patch, I insert my newly crafted methods in place of the originals. The code following this proceeds to initialize the API and use it as per the Todoist Python library docs. Abstract the caching piece out of the TodoistAPI class and implement a generic “None” caching class (aka the general interface). This interface would implement empty _read_cache() and _write_cache() methods. Provide a default file system caching class that would implement the current file system reading / writing that is currently embedded in the current TodoistAPI class. Allow the TodoistAPI class to pass in a configurable caching class. This would be something like a formal implementation of this Redis monkey patch, or other classes that implement caching with other backing stores. If no caching class is given to the API, it defaults to the file caching class so that it behaves as it does today out of the box. I have forked the todoist-python library, but I’ve not yet committed the changes I’ve been batting around. I will do that soon. That’s it! Making a couple slight tweaks to the existing Todoist Python library will enable you to write to Redis as a caching store. One could conceive that it would be equally trivial to implement these methods to write to other backends like DynamoDB or other platforms. I have provided this full snippet as a Gist on Github. If you are using Amazon WorkMail, but long for the interface of something like Gmail, then this post is for you! While I believe Amazon intended to make it tricky to forward mail from its service, it is still possible. Once you have authenticated and the mail interface comes up, you will want to click the gear icon in the upper right-hand corner of the window. 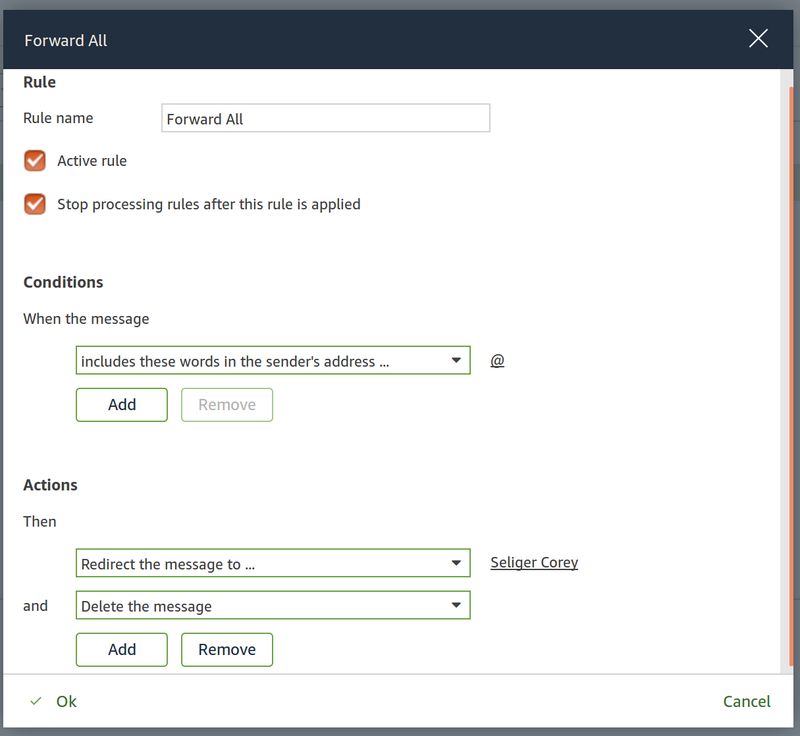 From the settings screen, select Email Rules from the left-hand navigation pane. It should be noted that this only solves the issue of new mail being routed to your destination email service. Anything that is currently in your inbox will remain unless you manually migrate those messages. I recently ran into a situation where AWS AppStream 2.0 might be a viable choice for securely delivering a desktop application required for an important pilot project. I won’t go into details, but the server-side of the pilot is already being hosted in AWS, so it only made sense to attempt to find a solution within that platform. It so happens that we do have full support for SAML via Shibboleth. However, the process to provsion and configure it may be overkill for a short term pilot with a limited number of users. That immediately means considering short duration URLs. Short duration URLs (or temporary URLs) are just that. They are a pre-authenticated URL generated by a trusted source and expire after a certain amount of time. AppStream 2.0 provides an API that generates these URLs. They can have a lifetime of one minute all the way through one day. Given the secure nature of this app, it is prudent to use pre-authenticated URLs for the shortest duration possible, and attempt to reduce the visibility of that URL as well. A web application or a web server directory protected by basic auth (or some other method) is invoked. The user provides normal credentials to the web application or to the browser authentication prompt. Because we have successfully authenticated a trusted user, the web app or custom crafted CGI script calls the CreateStreamingURL API. It passes the user’s login name to the API so that AppStream 2.0 can keep track of who is whom. The API returns the pre-authenticated URL to the web application or CGI. The web application or CGI immediately redirects the user to the AppStream URL. The user is presented with the AppStream interface, ready to be used. The rest of this post will detail a methdology for implementing such an interface. This will be as vanilla as possible, using only basic technologies to achive the desired outcome. You can take from this example and build a more robust solution in your own environments. This assumes that all of the aforementioned items are installed and that you have them configured in a suitable way. It is outside the scope of this post to detail web server and PHP configuration. Furthermore, if you are building this into your solution, take the appropriate liberties of inferencing what I am doing and make it fit properly. Last, but certainly not least, this assumes that you already have an AppStream stack configured, its subsequent fleet is running, and that the API will properly generate streaming URLs. You can validate this by selecting your stack and selecting “Create streaming URL” from the Actions menu inside the AWS console. Create an .htaccess file to protect the site. Below is a sample that uses the aforementioned .htpasswd file. You will need to create a restricted user that has the capability of invoking the CreateStreamingURL API. You will do this on the Identity and Access Management (IAM) tool within the AWS Console. Note: I use Resource: “*“ purely for convenience. Feel free to restrict this down to the stacks you intend to expose via this account. You will need to configure a credentials file on your system using the previously created credentials so that the AWS SDK for PHP will know how to properly connect to the AWS API endpoint. # Trigger the redirect to the short duration URL. NOTE: While assembling this overview, I apparently stumbled upon a bug in the AWS PHP SDK. The createStreamingURL() funciton is a part of AppStream 2.0, but the PHP SDK attempts to use the legacy API endpoint, causing issues. To work around this issue, I have forced the API to use the correct endpoint. I have no idea if this breaks the rest of the API calls related to AppStream. I do know it works for this example, therefore it will stand. You can follow the issue here on GitHub. Obviously this is overly simplified. However, it shows how easy it could be to integrate AWS Appstream 2.0 into your applications. Not sure if we will use this for our pilot project, but I feel better knowing that we have an option available to us if it is necessary. A friend and colleague of mine and I were talking late last year about some of the new features Amazon Web Services debuted during the 2016 AWS re:Invent conference. Two specific items that piqued our curiosity were Amazon Polly and Amazon Lex. 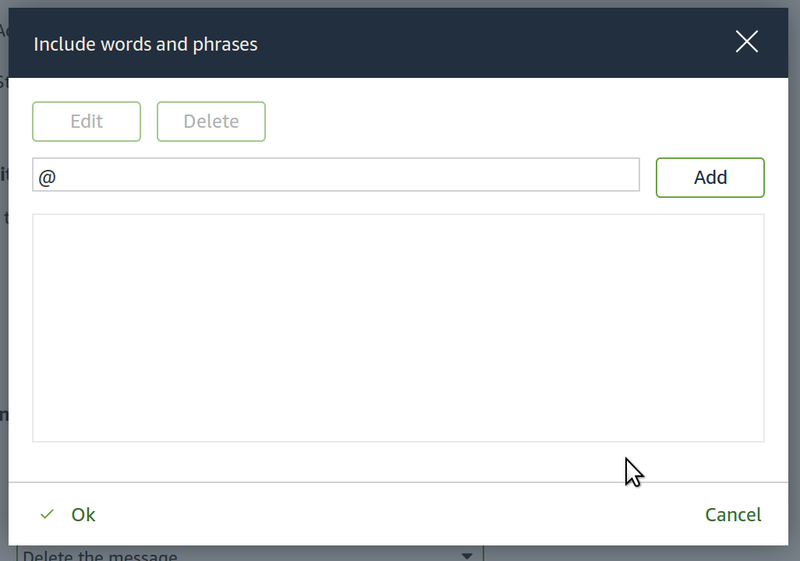 Quickly, Amazon Polly is a text-to-speech engine. Give it a string of words, an optional lexicon, and it will return a stream of audio in one of several formats. Amazon Lex, on the other hand, is an engine that not only translates speech to text, but will also attempt to understand the intent of the utterance given by the user. Given these two breakthrough technologies, there are opportunities abound. This got us thinking: what could we do with these technologies that have not been done before? We won’t get into those specific ideas, but what I will get into is a proof of concept of what this technology can do. Asterisk - Open source PBX platform. I happen to have one in my basement to run my phone system. While not necessary, it was good to have it connected to the PTSN so that others on the outside could test. I use Flowroute as my ITSP. I developed against Asterisk 13. Specifically, the important part is the the Asterisk Rest API (ARI). Weather Underground API - I needed a backend to get weather forecast information. WU provides a developer limited developer account at no cost to me. There are three major components that comprise the weatherphone application. On the far left side is Asterisk. In the middle, the weatherphone application. The Asterisk application Stasis transfers control of the call to an ARI application (here, weatherphone). Weatherphone handles incoming events from the REST API. Depending on the type of event (inbound call, DTMF tone, voice recording, etc. ), weatherphone can react in numerous ways. Currently weatherphone will listen for DTMF signals from the caller. Once it has 5 digits recorded for a given caller, it will send that zip code to WU for weather data. Weatherphone calls Polly on demand to translate text strings to audio output. Weatherphone also calls WU in order to get current conditions and forecast data. The code base, which can be found on GitHub, is functional. It’s not perfect, but it does prove that an Asterisk to Polly interface works. What’s missing is Lex. Why? Amazon Web Services hasn’t given me access to the limited preview. Until then, you have to enter in your zip code via DTMF. If you want to use Asterisk as your telephony interface, it has no concept of streaming audio. Everything has to be a file. This means you must run weatherphone directly on the Asterisk server, or some sort of shared storage needs to be implemented between the two services. I’ve looked around the Asterisk Wiki and forum, and the developers do not seem to think this is a priority. At best, in Asterisk 14, it is possible to playback a URI. In fact, they are still working on their own text-to-speech engine. Personally, I would rather them focus on being an excellent telephony solution, and not a text-to-speech engine. Nitpicking a little bit, I did not give a lexicon to Polly to help it render the weather forecast. So if the wind is west-southwest, all you here is “WSW” from Polly. Or that it is “23F” (literally pronouncing the “F”). That should be fairly straightforward to fix. Obviously the code I wrote isn’t production ready whatsoever. It does what it needs to do to prove a point, but it is buggy and not optimal by any stretch. Proceed at your own peril! Overall, this proves that is possible to integrate a cloud-based text-to-speech engine with a popular telephony solution. As soon as I can get access to Lex, I will continue improving this code base so that you can ask weatherphone specific questions and it attempt to give you a relevant answer. With those pieces together, imagine the possibilities! Since my brother-in-law and his wife are living with us for a few weeks while “the woods” is being finished, they have let me play around with their Google Home. It was a struggle from the get-go. First and foremost, if you’ve set your Google Home up elsewhere and expect to plug it in at someone else’s house and run their gear, you’re looking at the wrong device. Once we finally got it connected to my WiFi, it wouldn’t talk to any of my devices. Of course, we did things the hard way and did a factory reset by holding down the mute button for 10 seconds. Once it reset, I reconnected to the WiFi and MY Google account. Suddenly it was able to see my devices. I found this a bit strange as anyone who can access my network can see my other Chromecast devices without any sort of additional authentication. Why the Google Home can’t, I haven’t a clue. I have a VIZIO Crave 360 speaker that I received for Christmas. It sounds great. It’s even cute because I can put the Google Home and the Crave 360 into an audio group and cast to them simultaneously. Unfortunately, the Crave 360 shows how (relatively speaking) the Home’s speaker is inferior. Don’t get me wrong, for it’s size, it does an acceptable job. However, compared to the Crave 360, the sound is muddy and muffled. In Google Play Music, it has no idea how to play auto-playlists. For example, I really like to listen to the variety in my “Thumbs Up” list. No such luck. It has no idea about this supposed playlist. I cannot tell Google Home that I like a song. I would tell Google, “I like this song,” with the expectation that it would automatically add it to my Thumbs Up list (I suppose I shouldn’t be surprised given the bullet above…). How did I work around this? I told my phone to listen to the current track, tell me what it was, and go to it in the Google Play Music app. How backwards is that? Offhandedly, I told it simply to cast Youtube to the livingroom TV. It found some random TED talk about homosexuality and started casting it. This was only slightly awkward with my 4 and 7 year olds in the room who don’t quite yet understand those aspects of life yet. If you are not using the Gmail app, it does not sync your calendar. For example, I have been a long-time (well before Gmail supported Exchange Active-Sync) user of Nine, and while it integrates with the Google calendar on my phone, Google Home has no idea of anything on my agenda. Pity. I’m not alone. Corbin Davenport over at Android Police reported similar disappointments just yesterday. He made the comparisons between the Pixel, Google Now, and the lacking Google Home. In the comments people also put together the fact that Google rather keep halfway re-inventing the wheel, rather than just presenting one strong platform. Interesting theory. Don’t get me wrong. The Google Home is certainly cute, but for me it is a novelty. It needs to know more about the world it came from (e.g. Google an it’s plethora of platforms…). I feel like they spent more time teaching Google Home how to tell terrible jokes, rather than how to use the network of platforms it has connected to it, that we as humans are used to using. I really want to like it, because I tend to be a gadget guy. However, this one is not sitting well with me. I’d rather go buy another Crave 360 and have tunes simulcast throughout my house. © 2017 Corey Seliger All Rights Reserved.